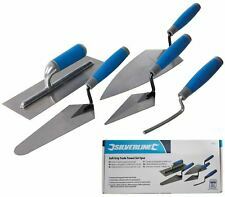 Silverline 5pc Soft-Grip Trade Trowel Set Hardened & tempered carbon steel blades. Comfortable, soft-grip handles for prolonged use. 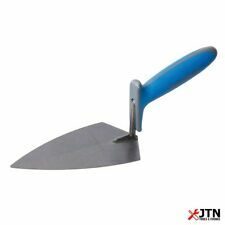 Contains the most popular trowels for common site requirements. 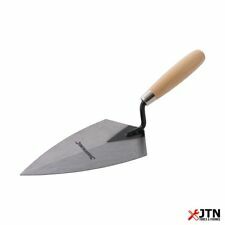 1 x Soft Grip Pointing Trowel 150 x 75mm. 1 x Soft-Grip Gauging Trowel 180 x 80mm. Includes 150mm pointing trowel, 180mm gauging trowel, 280mm plastering trowel, 280mm brick trowel and brick jointer. 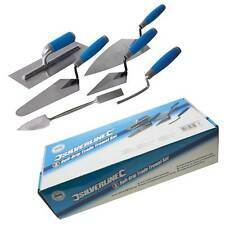 Silverline Plastering Trowel Kit (6 Piece). - Silverline 395016 Soft-Grip Trade Trowel Set (5 Piece). Includes 150mm pointing trowel, 180mm gauging trowel, 280mm plastering trowel, 280mm brick trowel and brick jointer. Hardened and tempered carbon steel blades and soft-grip comfortable handles. Size 200mm x 105mm. Comfortable, soft-grip handle for prolonged use. For laying bricks and blocks. Size 280mm x 105mm. Comfortable, soft-grip handle for prolonged use. For laying bricks and blocks. 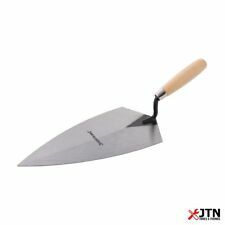 Silverline Brick Trowel 280mm. Edge of trowel is used to tap bricks level during laying process. Blade size 280mm. Blade width 130mm. 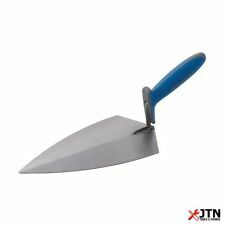 Silverline Brick Trowel 200mm. Edge of trowel is used to tap bricks level during laying process. Blade width 105mm. Blade size 200mm. Includes 150mm pointing trowel, 180mm gauging trowel, 280mm plastering trowel, 280mm brick trowel and brick jointer. About Silverline Tools. MORTAR RAKE. Ideal for creating a recessed joint finish to new brickwork. Uses an ordinary hardened masonry nail adjustable for depth. Edge of trowel is used to tap bricks level during laying process. Comfortable soft-grip handle with finger guard and thumb support. During that process you will be issued with an RMA number. Silverline 368091 Pointing Trowel Soft-Grip. Silverline | Soft-Grip Brick Trowel 200mm 427527 Hardened tempered, carbon steel blade Tang welded securely to the blade Soft-grip handle. Hardened and tempered steel blade with comfortable wooden handle. Silverline 283277 Stainless Steel Brick Jointer 5/8" x 1/2"
Silverline Brick Jointer 5/8" x 1/2". Stainless steel double ended brick jointer. Blade thickness 2.6mm. Silverline Brick Jointer Wooden Handle 13mm. Suitable for 13mm joints. Polished wooden handle. 10 x 150mm Pointing Trowel. Brickie Brick Trowels. We are able to demonstrate these products amongst others on our very busy, yet friendly trade counter. There is ample car parking space. Ideal to use and throw away at this price. Silverline 353307 Stainless Steel Brick Jointer 3/8" x 1/2"
Silverline Brick Jointer 3/8" x 1/2". Stainless steel double ended brick jointer. Blade thickness 2.5mm. Silverline Soft Grip Brick Jointer 150mm x 13mm. Size 150mm x 75mm. For pointing brick, block, slabs and selts. For pointing brick, block, paving & stonework. Hardened and tempered carbon steel blade. Comfortable, soft-grip handle for prolonged use. Taper-ground from heel to toe for flexibility. Finger guard, thumb support and high lift for good knuckle clearance. High-quality, hardened and tempered carbon steel blades and soft-grip comfortable handles. Includes 150mm pointing trowel, 180mm gauging trowel, 280mm plastering trowel, 280mm brick trowel and brick jointer. Includes 150mm pointing trowel, 180mm gauging trowel, 280mm plastering trowel, 280mm brick trowel and brick jointer.